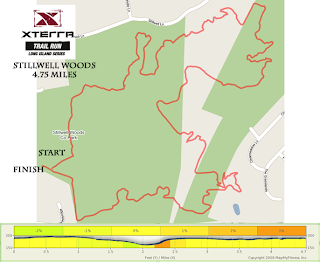 Will I be ready to tackle The Stillwell XTERRA race? I debated taking a rest day today after realizing I've run or elliptical-ed every day since last Wednesday. The workouts themselves have not been especially difficult but I am still rebuilding my strength and endurance daily. The process of recovery draws a fragile line between making modest gains and undermining progress through pushing just a little too hard. I'm happy with my progress and I'm okay with my relatively slow paces because I'm seeing that this program is working. I can definitely see myself returning to pre-January performance levels within the next month or two. This morning I made a decision that will test my recovery plan and I am happy for the challenge. I was reading TrailRunner magazine and saw, in a letter to the editor, a mention of the website Eastern Trail Racing. It's a website devoted to east coast trail racing and I looked through the listings and discovered an upcoming race at Stillwell Woods. The information was on a website called triandduit.com that has lots of information about the LI XTERRA trail run series. 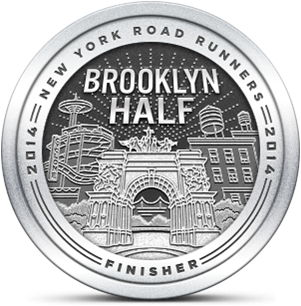 I signed up immediately and looked at the course map that covers a good part of Stillwell Woods. 4.75 miles over some of the toughest technical trails on Long Island. I sure hope I'm ready. If the race was held today I would be staying home, my conditioning has a ways to go before I can tackle that distance under those conditions. My wife encouraged me to do today's run at Stillwell and I initially planned to run four loops around the field that would total about 3.4 miles. I took off feeling good, the 27 degree weather was no match for my layers of running clothes. The trail was a mix of frozen mud, icy snow and soft packed dirt. My Helly Hansen Trail Lizards gobbled up the terrain without complaint and the conditions were good until the loop cut north and wind hit head on. I felt fine running but I was aware of some increasing fatigue and while I could have pushed it I resisted the temptation and kept it to a couple of loops plus a short detour into the wooded paths to remind myself of what Stillwell is really all about. In all I only covered 2.25 miles in around 23 minutes. It wasn't what I'd wanted but it was exactly what I needed. Is Vets-help.org a 501c3? Before donating I tried to evaluate them through several well known charity evaluators and they were not listed. Thank you for helping. If you do donate please let me know if I can post a mention (at any level of privacy you wish) on the website.